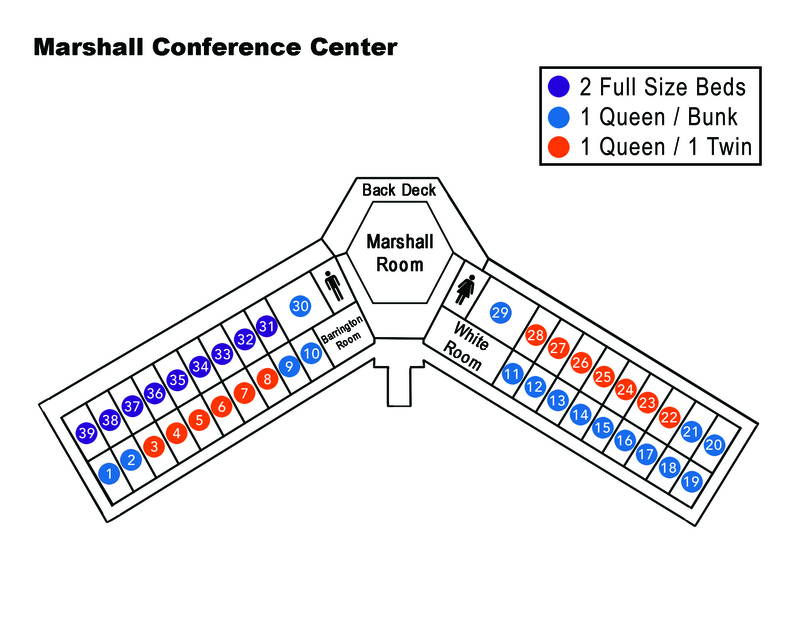 Another option in lodging here at Camp Zephyr is the Marshall Conference Center. The Conference Center houses 39 hotel-type rooms, as well as three meeting rooms. 16 of the 39 rooms are furnished with one queen-size bed & one set of twin bunk beds. 13 rooms contain one queen-size bed & one twin daybed. The other 10 rooms contain two full-size beds. Each of the rooms also has a private bathroom, A/C & heat, and both towels and bed linens provided. The Conference Center is a wonderful place for couples and marriage retreats, business, family or leadership retreats. You are also welcome to book one or two private rooms for speakers or bands who need more privacy, while the majority of the group is staying in the dorms. Availability is more limited at the Conference Center, so contact us today if you are interested in booking this facility!